The following article is based on Francesca Totolo’s research published on lucadonadel.it.1)Onlus e Migranti in Italia, Lucadonadel.it. Why is there a migrant crisis in the Mediterranean? Why are NGOs involved? 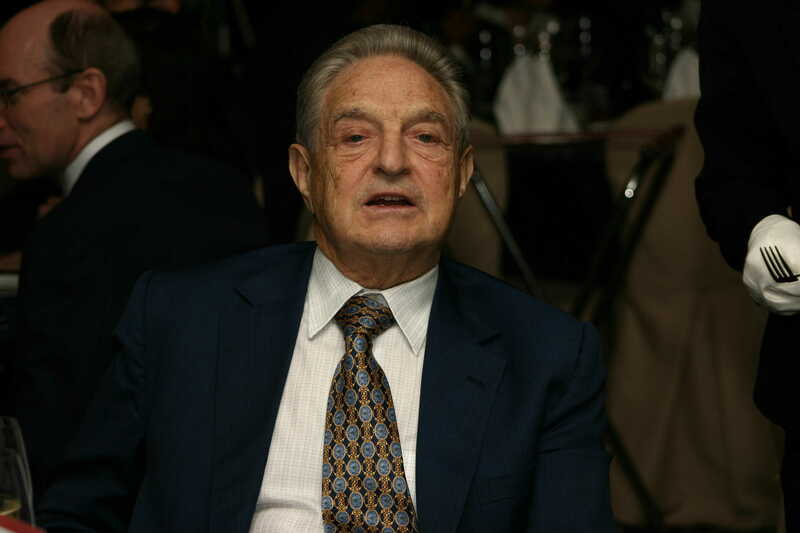 Because there is an extensive network of open borders activists and organizations behind it; many of them are directly funded by or cooperated with George Soros’ Open Society. Is it illegal? Not really. Political activism is an essential part of democratic societies. However, sometimes it goes too far, or the promoted causes prove to be either unrealistic or unsustainable. 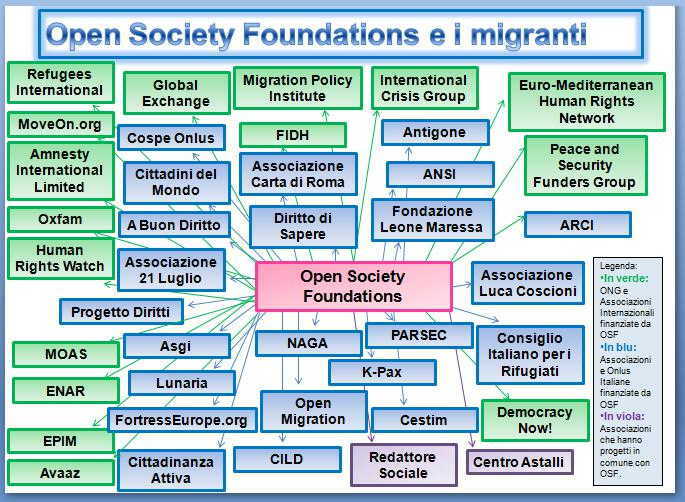 The network of the “immigration lobby’’ in Italy is made up of International NGOs financed by the Open Society Foundation (green), Italian NGOs financed by OSF (blue), and organizations with shared projects with OSF (purple). Associazione Carta di Roma was founded in December 2011 to put into execution a moral code for correct information on immigration. Since February 2016 the “Glossary’’ of the Charter of Rome (Carta di Roma) is an integral part of the “Unified charter of duties of the journalist’’.2)Testo Unico dei Doveri del Giornalista, Ordine dei Giornalisti Consiglio Nazionale.Permanent invited members are the UN High Council for Refugees, the International Organization for Migrations and the National Office against Racial Discrimination. The glossary of the Charter of Rome has been revised and corrected by the editors to guarantee political correctness, limiting the use of words that are deemed not adequate when the subject of a piece of news is without citizenship and in a foreign country. The accepted terms are: asylum seeker, refugee, person protected by subsidiary protection, beneficiary of humanitarian protection, victim of smuggling, irregular migrant (previously commonly defined as clandestine), mixed migratory influx. The term “clandestine’’ is now punished with fines, and warnings from the Order of Journalists.3)Linee guida per l’applicazione della Carta di Roma, Associazione Carta di Roma. In the majority of cases the Charter of Rome considers redundant mentioning the nationality of those who commit crime on Italian territory.4)Linee-Guida per L’applicazione della Carta di Roma, p. 35. Sponsors of the Charter are Open Society Foundations, the UNHCR and the Valdese Church.5)Chi Siamo, Associazione Carta di Roma. Associazione Carta di Roma lists the following “reliable’’ sources, many of which are Italian or international NGOs directly funded by the Open Society Foundation: Amnesty International, ASGI, COSPE, 21 Luglio, Fortress Europe, A Buon Diritto, Médecins Sans Frontières (MSF), Save The Children, currently involved in the migrant traffic in the Mediterranean and finally UNAR, recently involved in a scandal of gay prostitution. Cospe Onlus is a non-profit, private organization founded in 1983. It operates in 30 countries with 150 projects “to favour equal and sustainable development, respect of human rights, peace and justice for people’’, supporting the right to international mobility. Its goal is a world where “diversity is considered a value, a world with many voices, where the meeting of different people results in mutual enrichment and where social justice goes through equal rights and opportunities’’. Cospe is among the original founders and promoters of SOS Mediterranee Italia, an NGO that works in the Mediterranean cooperating with Médecins Sans Frontières on the ship Acquarius6)Sos Mediterranee 3800 persone salvate, Cospe Onlus. Cospe’s partners,7)Le Adesioni, Cospe.org.include the already mentioned Associazione Carta di Roma, which shares Cospe’s platform on “correct communication’’ on the immigration question; they organized seminaries for journalists on the topics of immigration and racial discrimination.8)Un corso per i giornalisti sui principi della Carta di Roma, Cospe.org.Carta di Lampedusa (Charter of Lampedusa) is a free association of individuals born in 2014 to work against laws limiting immigration and for the abolition of all European laws that limit freedom of movement.9)Preambolo, Carta di Lampedusa. The last budget published is from 2015. Cospe gathered funding of approximately €9.5 million, of which €7.5 million was from public subjects, the most relevant of which are the European Union (66%) and the Italian Ministry for Foreign Affairs (27%).10)Statuto e Bilancio, Cospe.org. ASGI’s task is to disseminate ideas on immigration laws among lawyers, jurists and academics; it has contributed to the creation of national and EU laws on immigration, asylum and citizenship, promoting political dialogue and protection of foreigners. ASGI was founded by the Open Society Foundation and is directly funded by it.11)Chi Siamo, ASGI. ASGI focuses heavily on the current situation in Hungary. The UNHCR requested a temporary suspension of asylum requests to Hungary, according to the rules of the Dublin Treaty: ‘“Given the worsening conditions of asylum seekers in Hungary, we ask to suspend the transfer of any asylum seeker to this country, until the policies of the Hungarian government are not in line with European and international law’’. Anti-discrimination service: ASGI provides juridical support against ethnic, racial and religious discrimination in Italy, with an operative centre in Milan and a number of secondary centres in Turin, Florence, Naples, Rome and Verona, a network of professionals that collaborate in monitoring discrimination matters. It is funded by Charlemagne Onlus, Tavola Valdese and the Open Society Foundations.12)Servizio Antidiscriminazione, ASGI. According to ASGI,13)Il nuovo manifesto dell’ASGI, ASGI 2017-03-21.the reasons for migration to Europe are: wars, repressive regimes and dictatorships, consequences of colonialism, exploitation of natural resources of the African continent, demographic growth, climate change. -on asylum the EU should: desist from hostile policies adopted in the last years such as the EU-Turkey agreement of March 2016, and collaboration with dictatorships such as those in Libya, Sudan, and Niger; create an obligatory redistribution plan for refugees, adjust the current Dublin regulation with the possibility of requesting asylum in the country chosen by the asylum seeker. Migregroup: it participates in the project Boats4people, and supports the online platform WatchTheMed, which maps deaths and violations of migrant rights at the external frontiers of the EU.14)Activites, Migregroup. WatchTheMed was founded by NGO Habeshia run by father Mussie Zerai, (self-proclaimed father Moses for his ability to make migrants arrive in Europe). The organization has a list for ‘’the good migrant’’, where interested people can find information on how to arrive in Europe through the Mediterranean. NGO Sea-Watch, currently present in the Mediterranean transporting migrants to Europe, is a part of the platform of WatchTheMed.15)How to contribute, WatchTheMed. ASGI collaborates with Associazione 21 Luglio, Senza Confine (No Borders), Doctors for Human Rights, SIMM (Italian society for medicine of migrations). Created in 2014, CILD is a network of organizations to promote rights and freedoms for everyone, with advocacy campaigns, public and legal actions. CILD supports easier access for migrants in face of “mixed influxes’’. After a recent change in the law to welcome unaccompanied minors in Italy, it pushed for a change in citizenship laws, currently materialized in the attempt to switch from Ius Sanguinis to Ius Soli. Its manifesto includes a change of vision on immigration, as a system of asylum, not criminal, based on welcoming duties and enlargement of citizenship.16)Chi Siamo, CILD. CILD activities include,17)Aree di Lavoro, CILD.the project Open Migration, which focuses on a fact-checking of news on immigration; its articles cover criticism of the investigation of NGOs in the Mediterranean,18)Notizie da un’ordinaria giornata di lotta in nome della sicurezza, CILD 2017-05-01.a claim that refugee appeals are not overburdening the judicial system,19)Tribunali intasati per il boom dei ricorsi dei richienti asilo? Falso, Open Migration 2017-05-17.and another claim that immigrants are overrepresentated in the jail system due to preventive custody,20)Tutti i numeri sugli stranieri in carcere, Open Migration 2016-01-17.ignoring the data showing that migrants commit crimes in Italy at 6 times the rate of natives.21)Ricerca shock: dagli stranieri più reati, Il giornale 2016-06-28. A Buon Diritto: an advocacy group on the immigration issue. Funded by the Open Society;22)Chi Siamo, A Buon Diritto. ANSI (National Association Intercultural Press): promoted and constituted by foreign journalists, supported by Cospe and Open Society;23)Ansi Homepage, Ansi-intercultura. Antigone: organization for the rights and warranties of the penal system, funded by the Open Society;24)Bilancio 2015, Associazione Antigone. ARCI: large popular movement to promote emancipation, with over a million subscribers, supported by Open Society;25)Arci Homepage, Arci.it. Associazione 21 Luglio: focuses on the Roma minority. Funded by the Open Society;26)Stato Patrimoniale 2015, Associazione 21 Luglio. CIR (Italian Council for Refugees): funded by Open Society;27)Cir-Onlus, Cir-Onlus. Cittadini del Mondo (Citizens of the world): open borders promoter, funded by Open Society;28)Cittadini del Mondo homepage, Cittadini del Mondo. Fondazione Leone Moressa: think thank with a focus on immigration, funded by the Open Society;29)Il profilo, Fondazione Leone Moressa. Lunaria: non-profit with a focus on globalization and migration, regularly collaborates with the Open Society;30)Costi Disumani, Lunaria 2013-05-07.31)L’Europa e i diritti dei migrant, Lunaria 2014-03-21.32)I diritti non sono un costo, Lunaria 2013-11-26. NAGA: migrant rights with a focus on Roma, funded by the Open Society;33)Bilancio 2015, NAGA. PARSEC: social studies research institute with a focus on immigration, created the project “parlare civile’’ (civil talking) that focuses on politically correct wording, supported by the Open Society;34)Parlare civile, PARSEC 2014-07-14. A Buon Diritto (For good law) is an advocacy group focused on immigration, its website is full of the contributions from the Open Society.35)A Buon Diritto Homepage, A Buon Diritto.Its president is Luigi Manconi, also known as Simone Dessì, a former activist of Lotta Continua (Contiued Fight), a communist party. Its publications include “Accogliamoli Tutti’’ (Let’s welcome all of them), a book that claims that “the only efficient immigration policy is welcoming everyone’’, citing replacement migration, the replacement of elderly, dying Italians with young immigrants as the core element of its thesis. It claims that this approach is based on “common sense and a pragmatic approach to govern immigration, not passively receive it’’. The foreword is by former Ministry of Integration of Italy Cécile Kyenge.36)Accogliamoli Tutti, A Buon Diritto 2014-11-07. Another publication is “Abolire il Carcere’’ (Abolish jail), a “reasonable proposal of reform for the safety of citizens’’.37)Abolire il carcere, A Buon Diritto 2016-06-03. -‘’Navigare a vista’’ (Navigate in sight), a “tale of the search and rescue activities by NGOs in the Mediterranean’’.38)Presentazione del rapporto Navigare a vista, A Buon Diritto 2017-05-29. -‘’The great lie of taxi-ships: NGOs and rescue in the sea’’, a conference attended by Luigi Manconi, Emma Bonino, former Minister of Foreign Affairs, and representatives of the NGOs Proactiva Open Arms, MSF and Save the Children, all currently active in the Mediterranean.39)La grande bugia delle navi-taxi. Le ONG e il soccorso in mare, A Buon Diritto 2017-05-05. The network, as exemplified by CILDI, is extensive and intricate. It ranges from former ministers, Kyenge (Immigration) and Bonino (foreign affairs), both directly responsible for the large influx of migrants being forcefully accepted into Italy, to support groups promoting press censorship, but also providing juridical support, advocacy and publications. Only in few cases one can inspect their budgets, not exactly a trait suggesting transparency and openness. The main theme of the Open Society network is to use anti-discrimination laws to promote unlimited migration via the abolition of borders. The idea is clearly stated in the manifesto of many organizations. Most organizations promote their extreme views as “fact based’’ or “common sense’’ to give themselves an aura of scientific approach, while providing subjective and ideological interpretation of data and omitting inconvenient information. That is also why they omit the nationality of the criminal. It’s equivalent to admitting there is a problem but it should not be talked about. This is typical of totalitarian regimes, not democratic and certainly not “open’’ societies. The stated goal of “correct information on the theme of immigration’’ is certainly not achieved this way. Finally, the no-borders strategy is being implemented with the widespread action of the immigration lobby in favour of NGOs operating in the Mediterranean. Whether through its funding or publications covering the topic, conferences, research or information channels for migrants, the network effectively provides support for migrants, regardless of whether they are legal or illegal. 1. ↑ Onlus e Migranti in Italia, Lucadonadel.it. 2. ↑ Testo Unico dei Doveri del Giornalista, Ordine dei Giornalisti Consiglio Nazionale. 3. ↑ Linee guida per l’applicazione della Carta di Roma, Associazione Carta di Roma. 4. ↑ Linee-Guida per L’applicazione della Carta di Roma, p. 35. 5. ↑ Chi Siamo, Associazione Carta di Roma. 6. 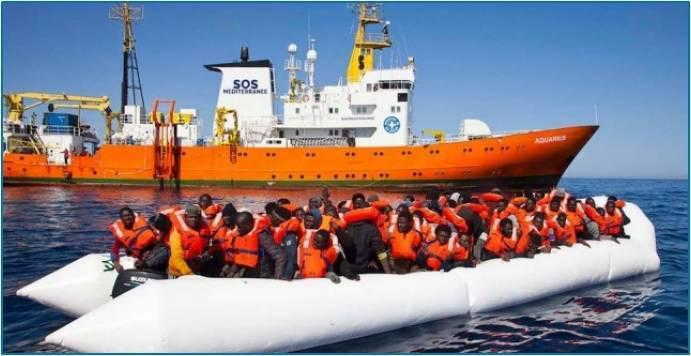 ↑ Sos Mediterranee 3800 persone salvate, Cospe Onlus. 7. ↑ Le Adesioni, Cospe.org. 8. ↑ Un corso per i giornalisti sui principi della Carta di Roma, Cospe.org. 9. ↑ Preambolo, Carta di Lampedusa. 10. ↑ Statuto e Bilancio, Cospe.org. 11. ↑ Chi Siamo, ASGI. 12. ↑ Servizio Antidiscriminazione, ASGI. 13. ↑ Il nuovo manifesto dell’ASGI, ASGI 2017-03-21. 15. ↑ How to contribute, WatchTheMed. 16. ↑ Chi Siamo, CILD. 17. ↑ Aree di Lavoro, CILD. 18. ↑ Notizie da un’ordinaria giornata di lotta in nome della sicurezza, CILD 2017-05-01. 19. ↑ Tribunali intasati per il boom dei ricorsi dei richienti asilo? Falso, Open Migration 2017-05-17. 20. ↑ Tutti i numeri sugli stranieri in carcere, Open Migration 2016-01-17. 21. ↑ Ricerca shock: dagli stranieri più reati, Il giornale 2016-06-28. 22. ↑ Chi Siamo, A Buon Diritto. 23. ↑ Ansi Homepage, Ansi-intercultura. 24. ↑ Bilancio 2015, Associazione Antigone. 25. ↑ Arci Homepage, Arci.it. 26. ↑ Stato Patrimoniale 2015, Associazione 21 Luglio. 28. ↑ Cittadini del Mondo homepage, Cittadini del Mondo. 29. ↑ Il profilo, Fondazione Leone Moressa. 30. ↑ Costi Disumani, Lunaria 2013-05-07. 31. ↑ L’Europa e i diritti dei migrant, Lunaria 2014-03-21. 32. ↑ I diritti non sono un costo, Lunaria 2013-11-26. 33. ↑ Bilancio 2015, NAGA. 34. ↑ Parlare civile, PARSEC 2014-07-14. 35. ↑ A Buon Diritto Homepage, A Buon Diritto. 36. ↑ Accogliamoli Tutti, A Buon Diritto 2014-11-07. 37. ↑ Abolire il carcere, A Buon Diritto 2016-06-03. 38. ↑ Presentazione del rapporto Navigare a vista, A Buon Diritto 2017-05-29. 39. ↑ La grande bugia delle navi-taxi. Le ONG e il soccorso in mare, A Buon Diritto 2017-05-05. Prev: Will the inter-religious conflict escalate in India? 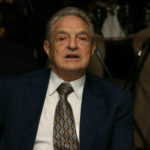 E’ acclarato ormai che le ONG di Soros rappresentano la punta avanzata del programma di sostituzione degli autoctoni italiani con l’«esercito industriale di riserva» e cioè i clandestini.